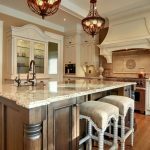 Kitchen Decorating Dilemmas | Bow Valley Kitchens Ltd. So what are the kitchen decorating dilemmas that you have been struggling with lately? You have this amazing kitchen, recently renovated, with a lovely countertop, beautiful cabinets, great hardware and all the hi-tech appliances that you would want. But what about the kitchen décor? We are experienced kitchen and kitchen cabinet designers and installers based in Calgary. Here, we answer some of the common kitchen decorating dilemmas that many homeowners have. What should you be placing in kitchen glass cabinets? Kitchen cabinets with glass inserts are a great addition to any kitchen. Glass inserts in kitchen cabinets give the kitchen a wonderful look and feel and are a nice way to break up the cabinetry. They are very aesthetically pleasing and allow you to display a variety of decorative pieces in the kitchen. They add a lot of style and panache to the kitchen. What should you place in the glass front cabinets? To begin with, make sure that the cabinets are not too cluttered or cramped. Don’t pack the cabinets with too many things. If the kitchen is painted white or with creamy colors, display something bright and colorful in the glass cabinet, such as a lovely vase. Add a variety of showpieces or decorative pieces to the cabinet of various shapes and sizes. What type of stools suit the kitchen countertops the best? Of what seat height should the stools be? You know you have to choose a stool of the right seat height for the countertop. In case you choose a bar stool that is too short, then it might be a difficult for you or for your guests to reach out and sit comfortably over the bar. If you choose something too high, then you will be forced to slouch over the bar. You want something that is of the perfect height for this reason. The bar stool should have a seat height of exactly 30″, and it should be height adjustable – just perfect to be paired with raised countertops. The counter stool should have a seat height 24″ and should ideally be paired with a kitchen countertop of a height of 36″. What is the right way to hang pendants over a kitchen island? You need the pendants over the kitchen island not just for the lighting but also because they are such attractive decorative pieces. But you should hang them at the right height. If you hang them too high, then you might not be able to get the focused lighting you need from the pendants. Hang the pendants too low, and there is always a chance that they might come in the way and you might clash against them. To be safe, pendants should be hung at a height of 28″-34″ over the counter or at a height of 72″ over the floor. 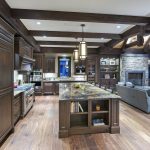 You are welcome to get in touch with the Calgary-based Bow Valley Kitchens for more answers to your kitchen decoration dilemmas. We have a team of experienced kitchen renovation experts who design and install custom kitchens and kitchen cabinets in homes across South Alberta.